To an extent difficult to appreciate today, early farm communities like Waterford were self-sufficient. Leather, for example, essential for harness, shoes and boots, belts for machinery, and many other products, was produced locally. The manufacture of leather was a complicated business, involving hard work and a series of – often malodorous – processes. First raw hides were carefully scraped on a fleshing beam to eliminate all traces of fat and flesh, then soaked for several days in a caustic lime solution to remove the hair or fur. After flushing with clean water (in the nearby creek), the hide was pickled, or tanned, by steeping it in a strong solution of ground oak or hemlock bark containing tannin. Sawmills in Waterford, including one just down Main Street would have furnished a steady supply of such bark. After another thorough rinse and partial drying, the skin was pulled and stretched until it was fully dry, pliable, and ready to use. Waterford craftsmen, like harness maker Asa Brown, and shoemakers Samuel Shipman and Charles Divine, would then make products for villagers and local farmers. Waterford's tanyard dates from the 18th century. The earliest mention found to date is buried in a June 1785 deed transfer from Joseph Janney to Richard Richardson: "Beginning at a stone on the south side of the Tanyard Run...." The reference is to a tanyard later purchased by William Hough and operated by his son Joseph. Eventually, William's grandsons Washington and Peyton Hough sold the business to Joseph Bond. And in 1830, Joseph, in turn, sold it to his brother Asa, by then in partnership with neighbor Thomas Phillips. Phillips had learned the trade while indentured to a Philadelphia tanner from 1792 to 1795. By 1858, Asa Bond purchased from Phillips' executors the "lower tanyard lot" on Main Street, just down the draw from 'the earlier tanyard. The record is not clear as to whether both tanyards ran concurrently or whether one succeeded the other as the village grew, but it is evident that the flatter, lower site could support a larger operation. The tannery appears to have been a family operation, with never more than a few employees. In 1870, Bond's son Thomas 19, and Israel Janney, 63, both a part of Asa's household, were identified as tanners. Because all owners of the tanyard were Quakers, no slaves worked at the site; only free African Americans and some white laborers. The tannery supported a substantial network of related tradesmen and clearly served a populace well beyond the town limits. Waterford censuses from 1850 through 1920 mirror its growth and decline. With the coming of the railroad to nearby Paeonian Springs in 1870, leather and leather goods were shipped increasingly from large manufacturing centers, and demand for locally made leather fell off. While six shoemakers shaped, stitched and hammered shoes and boots for the village in 1880, by 1900 only Charles Mullen carried on the trade. When Asa Bond died in 1877 it appears the tanyard operation ended with him. After his widow's death in 1886, the property passed through various hands until 1987, when the Waterford Foundation purchased it from the heirs of Ernest James. The core of that parcel is preserved by easement against inappropriate change. In 1993, Dan Kent, a Loudoun County High School social studies teacher, began a careful archeological examination of the site with a number of student volunteers. The project was a joint venture of the Waterford Foundation and Loudoun County Public Schools, aided by a grant from the Virginia Foundation for the Humanities and Public Policy. 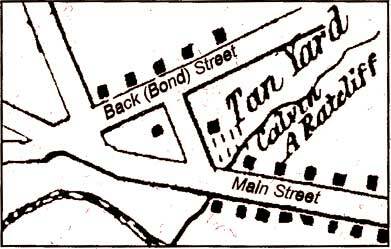 Rediscovering the Tannery Buildings An 1854 map of the village shows a tanyard, with numerous pits-still visible today, at the site of "the lower tanyard"; a map of 1875 shows not only a tanyard shed on the north side of Tanyard Run, but a structure on the south side of the creek, fronting on Main Street. The site of that building, not standing in living memory, was the first to be explored. Because of its proximity to the tanyard across the creek and common ownership of the land, it has been assumed that this unusual structure had something to do with the tannery business. Census records indicate that in the late 1800s a black family named Kenady lived there. The long-vanished tannery shed itself awaits further study. Twentieth century technology in the form of overhead infrared photography in early 1996 is expected to show the exact outlines of the shed as well as of two smaller structures suggested by preliminary probes. Quaker Asa Moore Bond, the man generally associated with the business of tanning leather in Waterford, was born in the village about 1804. He and brothers Edward, Joseph and Thomas were pillars of the thriving 19th-century village. Asa, Thomas and Edward were among the signers of a petition to Richmond, Virginia, to incorporate Waterford in 1835. In March 1836, when the petition was granted, Asa and Edward were elected two of the nine councilmen to govern the new town. Two years later, the three brothers signed another petition to Richmond requesting a bridge over Catoctin Creek at the mill. Perhaps it was no coincidence that Edward was at that time the owner of the mill. Joseph, too, owned a number of properties in the village, including the early, tannery, which he later sold to Asa. Thomas was a physician in the town. Asa owned and operated the tannery, solely or in partnership, from 1830 until his death, from "consumption", at age 73 in 1877. African-American Jonathan Kenady, born in 1820, was named after his father, who was born in 1789, possibly in Waterford. It is unclear whether the younger Kenady was born free, but he was living free in the village some years before the Civil War. Listed as a "laborer" in Loudoun County censuses, he may have worked at the tanyard: Census records from 1870 and 1880 show him living at the residence . on the tannery property. He also was one of five trustees representing the black community in the purchase of land on Second Street for a church and school. His son Jonathan attended the school occasionally in 1880. William Robinson, another African American whose Waterford roots date to the late 1700s and who was free as of 1850, is known to have worked at the tanyard. In an 1855 list of "Occupations of Free Negroes Over the Age of 12," Robinson was the only black man in the area to be identified as "tanner." Of his brother Silas, less is known, but the two were living in the Bonds' home near the tannery in 1850. In 1854, William purchased a simple log home on Water Street (more recently known as the "Weaver's Cottage"). The residence remained in the family until 1957. A number of Kenady and Robinson descendants live in the Washington area.